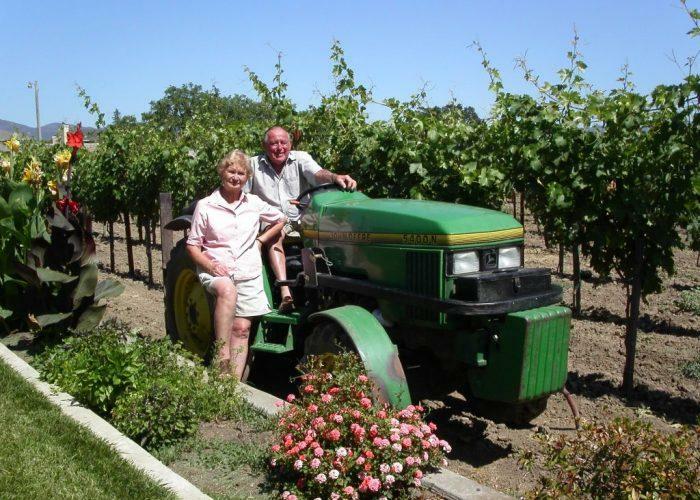 The Biale family, immigrants from Northern Italy, began growing grapes in Napa in the 1930's – Zinfandel only. Zinfandel, California's adopted grape, was widely planted by immigrants throughout the state's history as a highly flavorful red grape well-suited for its expansive range of arid climates and diverse soils. In the 1940's Aldo Biale sold bottles of illicit homemade Zinfandel known as "Black Chickens" over his party line phone service. In Napa Valley, market pressure for Cabernet Sauvignon and other French varieties has now made Zinfandel a rare variety comprising less that 3% of the valley's grape production. Committed to the tradition of farming Zinfandel, Aldo Biale and son Robert decided in 1991 to form a partnership with Marketer Dave Pramuk and set a goal of producing a world-class wine from the oldest Zinfandel vines on the Biale ranch in Napa's Oak Knoll District. The inaugural wine was a quantity of 400 cases produced from 8 acres of old non-irrigated low-yielding vines called "Aldo's Vineyard." Now, under the direction of Bob Biale, Dave Pramuk, and winemaker Steve Hall, Biale has established itself in the Cabernet Sauvignon saturated Napa Valley as a sort of renegade/ heritage-driven house of Zinfandel – making a series of wines of distinctly different personalities that resonate with the ultimate expressions of their sites – some being among the oldest vineyards in America. Unusual for Zinfandel, Biale has established a house style utilizing intensive old world Burgundian methodology from vineyard to barrel to bottle that combines elegance and balance, with Zinfandel's natural vibrance and intensity. With 20 Zinfandels nearly 20 years later, Biale is recognized internationally by writers and sommeliers as being among California's very finest producers of Zinfandel – the wines being featured on A-restaurant wine lists from coast to coast. Robert Parker, Wine Spectator, Food and Wine, and Decanter have all lauded Biale as one of California's top practitioners of Zinfandel. In addition to Zinfandel, Biale is recognized for producing blockbuster and ageworthy red wines from another California heritage variety – Petite Sirah, plus small lots of Syrah, Sangiovese, Barbera, Rhone blends, and Sauvignon Blanc. Wine Spectator 92 "Brooding and distinctive, with dark blackberry, licorice and Chinese five-spice powder flavors that build speed toward big but polished tannins. Best from 2020 through 2025. 1,500 cases made. –TF" Winemaker’s Tasting Notes: Intense deep, dark blue/black color profile. Wine Advocate 93 "The 2014 Petite Sirah Royal Punishers hails from Rutherford and has a wonderfully juicy blackberry and cassis nose with white flowers, licorice and incense. It is full-bodied and opulent without a hard edge to be found. This is a beauty that comes in at 14.9% natural alcohol. Stephen Tanzer 90 "Bright red-ruby. Crushed blueberry, black plum, pepper and spices on the slightly high-toned nose; a real essence of zinfandel. Silky on entry, then quite tight and unforthcoming in the middle, showing imploded flavors of black fruits, bitter chocolate and peppery spices. Wine Spectator 94"A real blockbuster, rich and ripe yet impeccably balanced. Offers aromas of freshly cracked pepper and blackberry, with complex and supple black cherry, toasty dill and licorice flavors that linger. Drink now through 2015. 390 cases made."